I am a frequent visitor to the ISKCON temple in Juhu, Mumbai and I love the vibes in the air in the temple premises. I love the simplicity in the affairs of the temple, and at the same time, the quest to achieve the inner most peace of the body and the mind. I must have read most of the books available in the book store attached to the temple, and insist to all to compulsorily read “BHAGWAD GITA.. As it is”. With this lineage, I was very excited to lay my hands on “The Journey Home”. 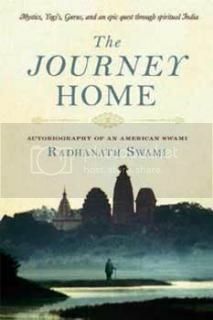 This book is the transformation of the nineteen year old, Richard Slavin to Radhanath Swami. Like most of the teenagers of that time, Richard was immersed in the hippy counter culture and started off on a quest to find himself. He takes off to the most exotic locations in Europe with a bunch of friends, hitchhiking through Amsterdam, Florence, Rome, and all of this with literally no money. During this journey, a vision directs him towards India, which he reaches via Cholera infected Turkey, Afghanistan and Pakistan over a journey more than six months. In India, Richard describes his brushes with various spiritual personalities he encountered, and his genuine curiosity to learn the secrets of a fulfilling life from them. His troubles evoke empathy many a times, and his little triumphs make you feel warm and happy. The mentions of the internal conflicts faced by him, and the inner voice communicating to him in all his dilemmas are all detailed out in detailed manner. It makes the reader feel that you are actually present there as a silent spectator watching the adventurous journey the author goes through. The experience that he has with baba Ram Dass and Neem Karoli Baba (Who I had earlier heard of in Steve Jobs autobiography), explain a lot of dilemmas faced by him, and the internal battles he was going through. After all the interesting interactions with himself and varies personalities in terms of teachers, social workers, cult leaders, Richard found his calling in Bhakti Yoga, and a guru in his holiness Srila Prabhupada of ISKCON. Overall, anyone, with even a faint interest in Spirituality should compulsorily read this book. It is a heavy book, and I suggest pacing it out over a month to grasp the maximum out of it. This journey needs to be made into a movie to spread the message, and to bring out the confusion all of us face when it comes to spirituality. Disclaimer: This book was sent to me for a review.